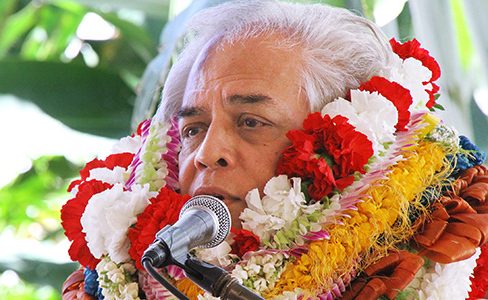 The Moanalua Gardens Foundation, which sponsors the annual Prince Lot Hula Festival, presented widely respected Hawaiian culture expert and Polynesian Cultural Center retiree Cy Bridges with its inaugural Nāmakahelu Oli master chanter’s award at the Iolani Palace bandstand in Honolulu on July 16, 2017, during its 40th anniversary event. 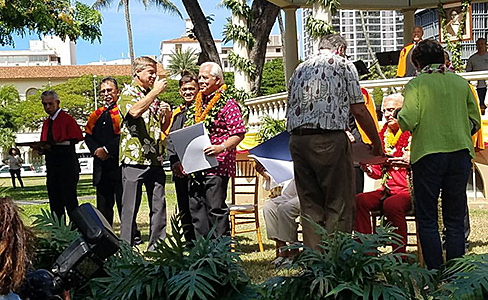 As part of the event’s 40th anniversary this year and to highlight the presentation of the inaugural chanter’s and other awards, the foundation temporarily moved the festival from its customary “home” at Moanalua Gardens to the grounds of ‘Iolani Palace. The nonprofit Moanalua Gardens Foundation started the Prince Lot Hula Festival — the largest non-competitive hula festival in Hawaii — 40 years ago in honor of Prince Lota “Lot” Kapuāiwa: He reigned as King Kamehameha V from 1863-1872 in the Kingdom of Hawaii. He was the first Hawaiian monarch to encourage the revival of traditional Hawaiian cultural practices. 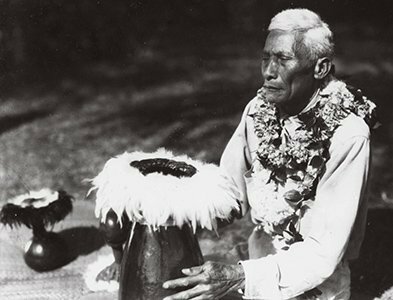 Nāmakahelu, the award’s namesake, passed away in the 1940s in her 90s. “Everybody associates me with Tūtū [grandfather or older generation] Kuluwaimaka, who was a chanter there. In fact, it was said he delivered the house-warming chant when the palace first opened” [in 1882], Bridges said. He added that when the last Kingdom of Hawaii monarch, Queen Lili’uokalani, died in 1917, it was Tūtū Kuluwaimaka who chanted for her funeral procession as it made its way from ‘Iolani Palace to the Royal Mausoleum of Mauna ‘Ala. About 30 years ago Master Chanter Ka’upena Wong presented Bridges with the first Nipolo Award from the Chanters Art Foundation. Wong made the presentation during the King Kamehameha Hula and Chant Competition. So, no one should be surprised that “Uncle” Cy’s skills have been in demand for a long time. He chanted, for example, at the dedication of the renovated ‘Iolani Palace and Kalākaua Crypt, the opening of the Hawaiian Hall at the Bishop Museum and the formal welcoming of Te Arikinui Te Atairangikaahu, the Maori Queen and her delegation, along with other museum events. Other noteworthy events where Cy provided the traditional form of Hawaiian welcome includes the celebration of the release of the Duke Kahanamoku U.S. postage stamp, the visit of the Dalai Lama at Kualoa Ranch and numerous events surrounding the Hawaiian sailing canoe Hōkūle’a. Of course, Bridges welcomed many VIPs to the Polynesian Cultural Center with Hawaiian chants over the years; and he chanted for the inauguration of Dr. John S. Tanner, current president of Brigham Young University–Hawaii, which works closely with the PCC. 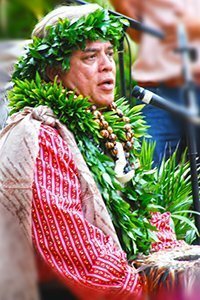 In addition to his work at the Center, Bridges is also internationally known as a musician and emcee, Hawaiian genealogist, kumu hula or master hula teacher in Hawaii, Japan, and the U.S. mainland. He has judged for the well-known Merrie Monarch Hula Festival in Hilo and a number of other hula and cultural events; and he is a current board member of the Mary Kawena Puku’i Cultural Preservation Society. Story by Mike Foley, who said despite PCC human resource records, Bridges was already at the Polynesian Cultural Center in 1968 when he started working there off-and-on ever since. Foley — who sometimes goes by the Hawaiian/Samoan name Mikaele — has been a full-time freelance writer and digital media specialist since 2002, and had a long career in marketing communications, PR, journalism and university education before that. He learned to speak fluent Samoan as a Mormon missionary before moving to Laie in 1967 — and still does. He has traveled extensively over the years throughout Polynesia, other Pacific islands and Asia. Foley is mostly retired now, but continues to contribute to various PCC and other media.